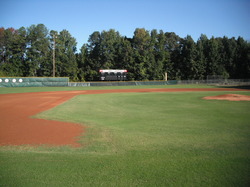 Horace Jackson Baseball Field in Jefferson, Georgia. Home of the Jefferson baseball Dragons. Looking out into Left Field. Up the steps into the right field stands at the baseball stadium. The Lady Dragon Softball press box on the main softball field in the Jefferson Baseball/Softball Complex. 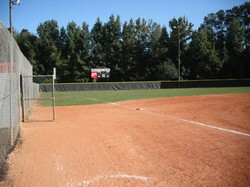 Looking down the left field line at the number two softball field in the Jefferson Baseball/Softball Complex. The third base side of the baseball diamond. Home plate from down the right field line. The Jefferson baseball/softball in-door practice facility looms in the background. 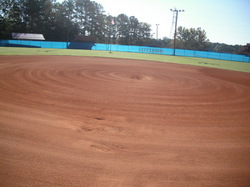 The Jefferson High School in-door practice facility located in the Jefferson Baseball/Softball complex. Looking toward the baseball field from beside the softball field. Looking at the main softball field from just in front of the press box.